We are already past halfway through 2018 and already a lot has been achieved. And still, there more to come until December this year. Let's take a look at what's on everyone's to do list for everyone that's involved in realising the European Open Science Cloud (EOSC)! Starting from the 3rd quarter of 2018, the Rules of Participation will be drafted and stakeholders will be consulted. At present, there is an ongoing Open Consultation targeting stakeholders that was launched by the EOSC High Level Expert Group and EOSCpilot. Building on the work of EOSCpilot, the Rules of Participation (RoP) will be scoped, identifying the main topics that the RoP should cover (e.g. financial mechanisms and procedures, legal aspects, Fair Data principles, interoperability) and setting out the key principles. Later, the governance structure will further elaborate the RoP through a dedicated working group and the stakeholders and with the support of the INFRA EOSC-05(a) project. Within the scope of EOSC architecure, the different components of the EOSC federating core (e.g. EOSC shared resources, EOSC platform, compliance framework) will be organised and operationalised to facilitate, monitor and regulate as appropriate day-to-day transactions across the federation. National, horizontal and thematic data infrastructures (e.g. research data repositories, service providers, scientific networks, RI and eInfras) will be surveyed to establish their interest, willingness and ability to join the development phase of the EOSC. Requirements for FAIR-accredited/certified data infrastructuress will also begin to defined, based on the adherence to the EOSC Rules of Participation. Work will also begin to establish and update the registry of the federated data infrastructures to monitor and enforce compliance of the rules and commons through the FAIR accreditation and certification scheme. Work on the EOSC architecture will be building on the work being carried out by EOSC Hub, OpenAIRE, FREYA and EOSCpilot projects as well as the MERIL and RICH projects. A milestone to be reached in Q3 will be the launch of the FAIR Data Action Plan that will identify, prioritise and promote high-value actions until 2020 to operationalise the FAIR data principles and will allow researchers to share and reuse research data across disciplines and borders. The FAIR Data Expert Group will draft the FAIR Data Action Plan and consult with stakeholders. It will entail the involvement of organisations active in the practical implementation of the FAIR data principles at European and global level (e.g. RDA, CODATA, WDS, GOFAIR) via dedicated events and consultations, notably the Open Consultation launched during the last June 2018 EOSC Summit. From Q3, a proposal for a European Framework for FAIR Research, in line with the existing European Interoperability Framework, will begin. The aim is to emphasise on how FAIR data principles should apply in practice and to define a set of basic FAIR data guidelines in the form of recommendations, as a commonly agreed approach to the implementation of the FAIR Data Action Plan. Furthermore, the Executive Board and FAIR Data Working Group will analyse the legal landscape concerning data reusability. This will identify barriers (e.g. sectorial or geographical restrictions, different and vague data licence models, etc.) to the implementation of the FAIR data principles, as well as opportunities. Throughout the 3rd quarter of 2018, work will continue in surveying user communities to identify their current and potential needs in terms of data services, collect, assess and document services currently provided by e-Infrastructures and research infrastructures, define an initial catalogue of services to be provided via the EOSC, and define the delivery model(s) for services, and identify actors and resources needed. Also, from Q3, work will begin on mapping EOSC's offer against demand, identifying gaps, i.e. needs that are partly or not covered at all. This work will build on eInfraCentral, OpenAIRE Advance and EOSC-hub. Ongoing work will continue in Q3 and Q4 on defining the specification of a common metadata for datasets. eInfraCentral and EOSC-hub, with the support of the EOSCpilot, will develop the common specification for the description of EOSC services and the EOSC service catalogue. Also, EOSC-hub, with the support of EOSCpilot and other projects via INFRAEOSC (if needed), will develop the common specification for the description of EOSC datasets and the EOSC data catalogue. Furthermore, organisations active on the practical implementation of the FAIR principles at European and global level (e.g. RDA, GO-FAIR, CODATA) will be involved and used as forums to reach consensus. The EU Rolling Plan for ICT Standardisation will be taken into account as an instrument for the development of missing specifications. The beta-version of the EOSC platform will also continue to be developed through Q3. Meanwhile, work will begin on defining the specification of a common metadata for services to facilitate service findability, cross-reference and interoperability between service catalogues across disciplines/member states, supported by eInfraCentral and EOSC-hub. A milestone to be reached in Q3 will be the launch of the preparatory work in support of the set-up and initial operation of the EOSC governance framework. The EC, with the support of EOSCpilot, will elaborate processes and documents that support the setup and initial phase of the EOSC governance. This includes the procedures for selecting and instituting the Executive Board, through establishing a standing search committee for suitable candidates (similar to the procedure used for identifying new members of the ERC Scientific Council). Member States and the EC will decide the setup and membership of the EOSC Board. The EC will also prepare initial documents to be further elaborated by the Governance framework in its initial phase, such as the draft Rules for Participation and draft shared resources. From Q3, the EOSC governance framework will be formally set up and the initial strategy and work plan will be adopted. The EOSC governance is set up as an agreement of the Member States at the ministerial level. The EOSC Board will be set up first, made up of representatives of Member States, Associated Countries and the European Commission. Subsequently, the Executive Board will be set up and approved by the EOSC Board. The Working Groups will also be set up and members will be elected by the Executive Board. Upon its establishment, the EOSC governance further elaborates on the work by the EC and adopts its initial strategy and work plan. The operations of the EOSC governance are supported by EC funding through the call INFRAEOSC 05(a). A milestone for the 4th quarter of this year will be for EOSC-hub to produce a prototype of the EOSC. This is foreseen to be a pan-European federation of data infrastructures built around a federating core and providing access to a wide range of publicly funded services supplied at national, regional and institutional levels, and to complementary commercial services. The federating core is understood to be constituted by EOSC shared resources and by a compliance framework including notably the Rules of Participation. 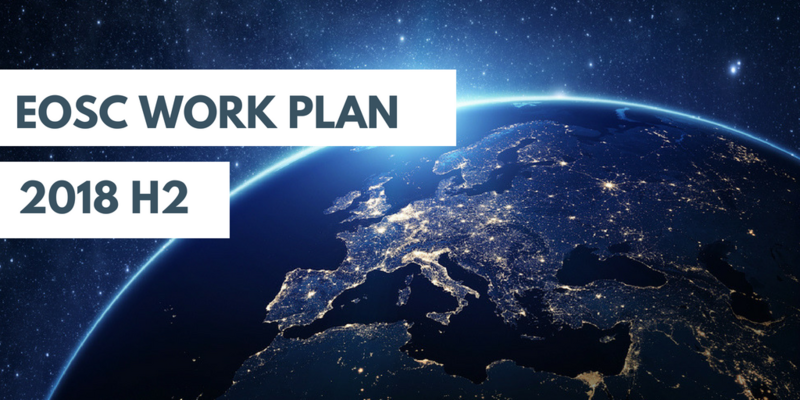 The Horizon 2020 Work Programme foresees developing the initial shared resources around the EOSC-hub project, the EOSC Portal and a catalogue of data infrastructures and services. Milestones for Q4 include the launch of the initial EOSC Catalogue of Services and for the EOSC Portal to be accessible. The Catalogue of EOSC services will include both thematic and generic services for data storage, management and analytics, simulation and visualisation, distributed computing, etc. This will help researchers to discover, select and use the services they need. Milestones to reach by the 4th quarter of this year would be the specification of a common metadata for datasets, the specification of a common metadata for services (based on EOSC-hub), and for the prototype of the EOSC portal to be accessible (through EOSC-hub and eInfraCentral). Work will start from Q4 on further development of the EOSC portal offering access to the full range of EOSC services based on the EOSC-hub, eInfraCentral and the INFRAEOSC-06(a) projects. This will build a universal entry point (the EOSC Portal) to the EOSC service and data gateways, accessible by all potential users via a full-fledged functional/comprehensive user interface, irrespective of geographic location or scientific affiliation. It will also provide policy-related information such as the mission and vision of the EOSC as a policy action, information related to the implementation of the EOSC (roadmap, national initiatives, FAIR action plan implementation), information on the governance of EOSC, and the Rules of Participation for all EOSC actors. From Q4, the Governance framework will be mandated to elaborate further the draft Rules of Participation through a dedicated working group and the stakeholders and with the support of the INFRA EOSC-05(a) project. A milestone to be reached by Q4 is for the EOSC Board to be established followed by the first meetings of the Executive Board and Stakeholder Forum to be held, as well as for the First Annual Work Plan to be adopted by the Governance structure. As you can see, 2018 will be a pivotal moment for the EOSC overall with the first iterations of the Service Catalogue, Rules of Participation and the Governance Structure all coming together by the end of the year. One way you can take an active part in all this is to contribute recommendations to the EOSC Open Consultation. Check out the current recommendations and contribute now!